Langham Lodge01263 715779work01603 870304fax Self-cateringLuxe living at its best Langham Lodge is a fantastic, spacious holiday house for family and friends to enjoy. Spread out and relax - there are 3 en-suite shower rooms, plus a further shower room and family bathroom, there is a fabulous sitting room and a snug, as well as a games room and with two televisions everyone gets to watch what they want on the TV. Set in a large garden cook up a storm on the barbeque and enjoy the far reaching countryside views. Close to the iconic north Norfolk coast with its super sandy beaches, quaint villages, nature reserves and historic houses, this is an area just waiting to be explored. Langham Lodge offers weekly bookings starting on Friday. Luxe living at its best Langham Lodge is a fantastic, spacious holiday house for family and friends to enjoy. Spread out and relax - there are 3 en-suite shower rooms, plus a further shower room and family bathroom, there is a fabulous sitting room and a snug, as well as a games room and with two televisions everyone gets to watch what they want on the TV. Set in a large garden cook up a storm on the barbeque and enjoy the far reaching countryside views. 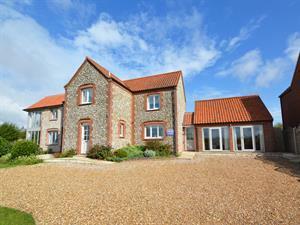 Close to the iconic north Norfolk coast with its super sandy beaches, quaint villages, nature reserves and historic houses, this is an area just waiting to be explored.